Next month, at its annual gala in New York, the Council of Fashion Designers of America will give the coveted International Award to Maison Valentino’s Maria Grazia Chiuri and Pierpaolo Piccioli. The award is a testament to what the duo have created at the house since their appointment as joint creative directors in 2008: Under their stewardship, Valentino has maintained its status as one of fashion’s most important and most creatively exciting brands. And though Chiuri and Piccioli have certainly put their own stamp on Valentino, a large part of their success is due to the fact that they are so engaged with the house’s heritage. Chiuri and Picciolo’s latest Ready to Wear collection is a case-in-point. The Fall/Winter 2015 show opened with several bold, graphic looks in black and white. That graphic use of black and white has been a Valentino signature since the mid-1960s: To wit, the suit from the Spring/Summer 1965 collection done in a magnified, handmade tweed of black and white velvet, jersey and valencienne lace ribbons, and the iconic black-and-white polka dot pantsuit so memorably photographed on Veruschka by Franco Rubartelli. 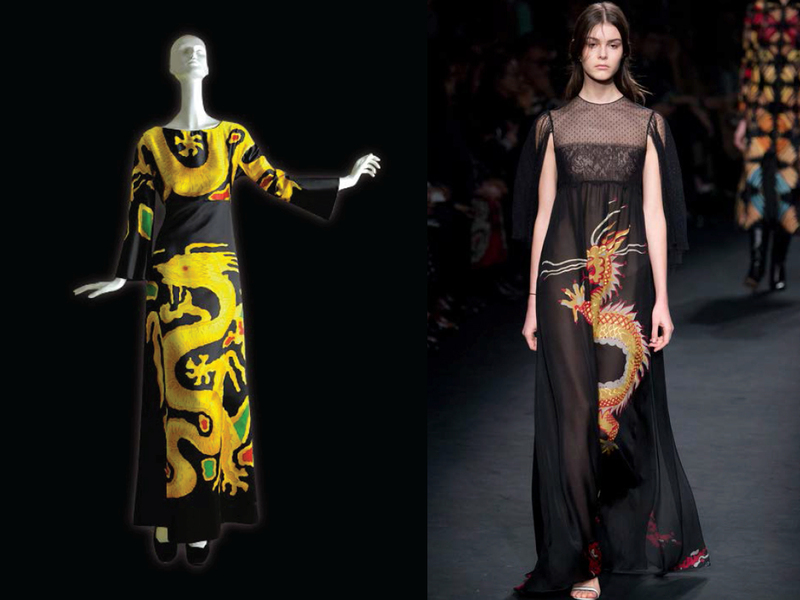 The FW15 collection also featured several looks with chinoiserie graphics and embroidery, designed in collaboration with mod legend Celia Birtwell; the dragon motif was a direct homage to the one that Mr. Valentino used in his Fall/Winter 1968 collection. 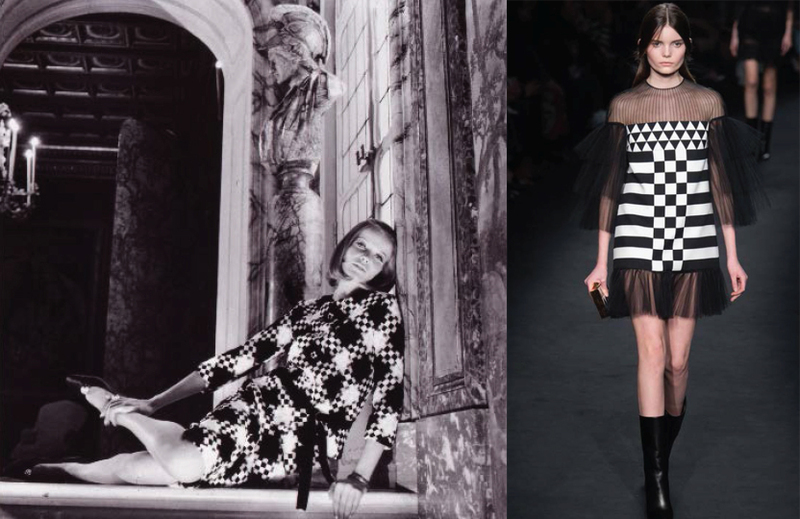 This was hardly the first time that Chiuri and Piccioli have made significant use of the Valentino archive. Their special couture show in New York last fall paid tribute to the legendary “Non Color” show presented by Mr. Valentino in 1968. Two of Chiuri and Piccioli’s standout collections—the so-called “Girl with a Pearl Earring” Ready to Wear collection for Fall/Winter 2015, and the Spring/Summer 2012 Haute Couture collection riffing on the era of the Enlightenment—extrapolated Mr. Valentino’s fascination with 17th Century baroque aesthetics. 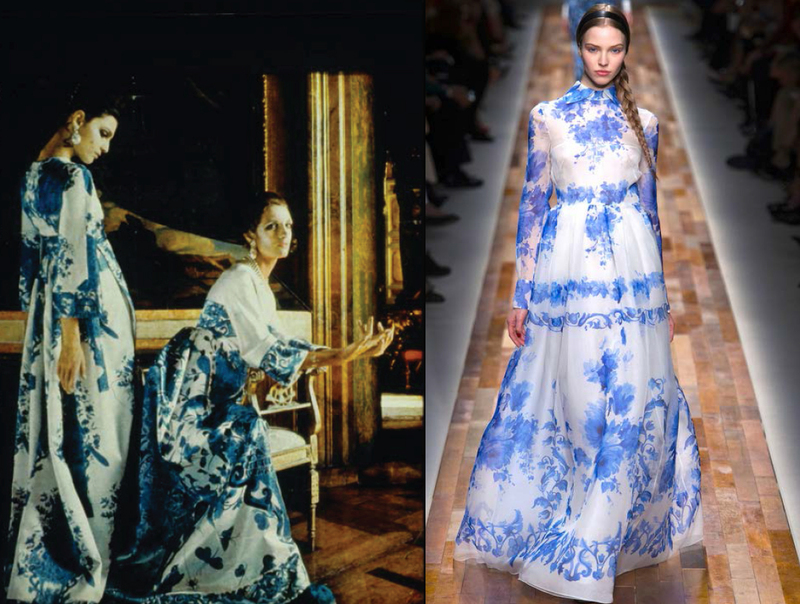 Their printed Delft blue gown for the FW15 RTW quoted a famous one of Mr. Valentino’s from 1968, and their nod to Marie Antoinette and her milieu in the couture had ancestors ranging from Mr. Valentino’s damask-print gown from the Spring/Summer 1998 Haute Couture collection, to his “garden” dresses from 1971. 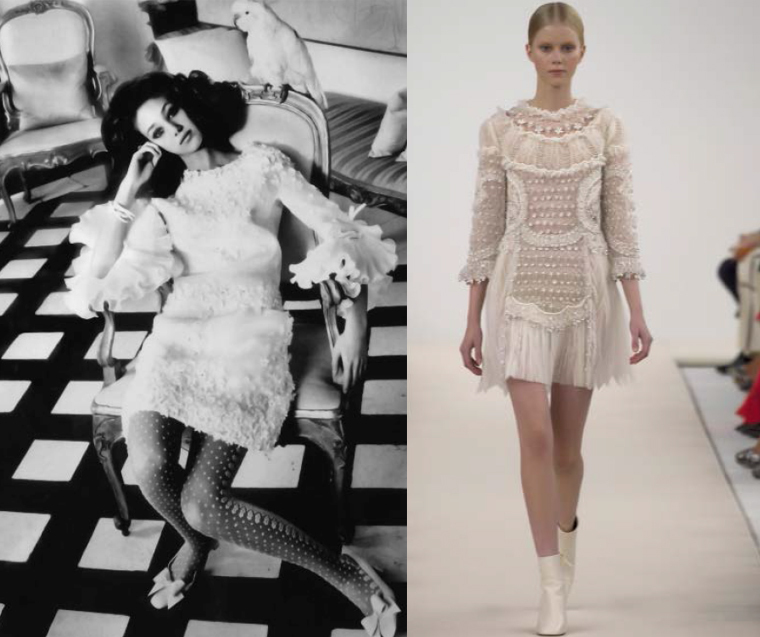 And certain key Valentino themes recur nearly every season: Chiuri and Piccioli don’t stint on “Valentino red,” they’ve done innumerable updates on the high-neck, bell-sleeve wedding dress worn by Jackie at her marriage to Aristotle Onassis (perhaps Mr. Valentino’s most famous single look), and their relish for lace and luxe embroideries carries on the Valentino legacy of rich surface detail. The words written by Pamela Golbin in the book Valentino: Themes and Variations, speaking of Mr. Valentino’s use of floral designs, applies just as well to Chiuri and Piccioli’s approach to embellishment. “Adapted to changes in taste,” Golbin noted, “Valentino’s flower motifs were printed, encrusted, stylized, shaped, painted, or embroidered in delicate expressions of an exemplary feminine grace and sophistication.” It’s that “exemplary feminine grace and sophistication,” in particular, that Chiuri and Piccioli resurrect again and again: You might even call it the Maison Valentino tradition.